There is an interesting tradition in knife sales. At least in Sheffield. If you give someone a present of a pocket knife - which is one of the great father's day gifts, the giftee is supposed to pay you a token sum for it. They are buying the knife from you, you aren't giving them a sharp edge that will cut the friendship. So just to be safe, if you get your dad a pocketknive for father's day - you might want to ask him for a buck or two. Tell him why, Father's day is about tradition anyway so I doubt he will object. Of course the same tradition occurs if you are giving your progeny a knife as a graduation present. The knife as they say, "can cut both ways". A lot of the staff here at TFWW carry pocketknives all the time. Myself included. They are constantly needed in the shop and warehouse. 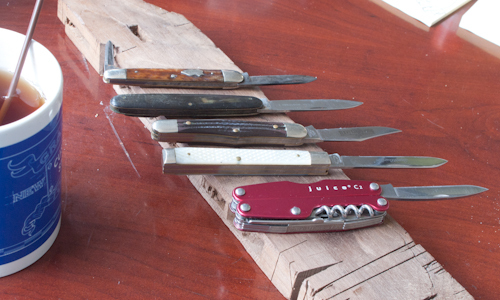 The photo above is the collection of everyone's personal knives. Two are old models we used to sell, the one in the background is a family heirloom, One is very old, the bottom, a leatherman, is brand new (but not one we stock). My Polish mother gave me a kitchen knife she did not use, but I had to pay her a penny for it. I have a similar Leatherman Juice multitool and carry it with me any time I'm not in the office. I can't tell you how often and handy it is to have screwdrivers, knives, scissors, and of course a bottle opener. I have two young kids and it works well for both opening new toys and replacing batteries in old ones. It is not as small as just a knife, but I would not want to carry anything else. I have tried other multitool brands/styles and this one is a cut above (sorry, couldn't resist). Our family also has the tradition for gifting knives. In our case, a penny is included with the gift and is returned as payment for the knife. Is the one in the background ("... family heirloom") a Schrade, Walden N.Y. U.S.A.? I have just come into the possession of one with 832 stamped on one side with the other side stamped "Schrade, Walden N.Y. U.S.A." Unfortunately my Schrade comes with the tip broken off (less than a 32th of an inch.) But, I will use it as intended; carry it and use it as needs dictate. The funny thing is that it wasn't an heirloom when I found it-- it was in a suitcase full of junk-- but it will absolutely be an heirloom by the time I pass it along. As a knifemaker, the coin/gift superstition ritual came up a lot. My usual tactic when giving a knife was to ask for a coin first without stating any reason. Eventually, everyone manages to produce a coin if you look like you need it badly enough. Depending on how you sell it, people will half-expect you to perform a magic trick when you finally get your coin. This is when (with flourish, of course) you give them the knife. Believe me, this act is easier with pocketknives. I once tried this move with a custom carving set at a wedding. The bride produced a silver sixpence. The maid of honor cut an artery rummaging through the gift box.